While Burwell Enterprises’ 39th aircraft, a Falcon 900EX, was in prebuy at Duncan Aviation in Battle Creek, Michigan, Peter, president & CEO, sought recommendations on whom to work with in order to sell number 36, a Challenger 601. 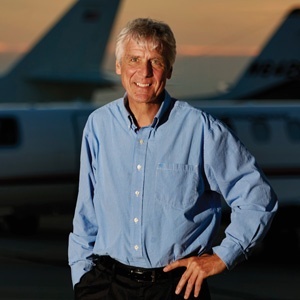 It took no time at all before he was handed the name of Doug Roth, one of Duncan Aviation’s Aircraft Sales and Acquisition team members. Burwell Enterprises has operated and flown so many aircraft over so many years that when it comes time to add to or upgrade their fleet, Peter puts his trust in the experience of his flight department to research and find the right replacement aircraft while at the same time working with a broker to handle the previous aircraft’s consignment. Although because of previous encounters, he was skeptical when he picked up the phone to call Doug Roth. Doug has been selling aircraft for customers for more than 36 years. During that time, he has learned that no two transactions are alike. What works for one customer will not necessarily work for the next. So the first thing he does when he talks with a client is LISTEN. After meeting with Peter and examining the Challenger, Doug tapped into the technical resources at Duncan Aviation. Armed with the knowledge of airframe, engine, avionics and interior experts and his personal knowledge of and experience with the preowned aircraft market, Doug told Peter exactly what he would do to best represent him and the aircraft. Then, he followed through and did what he said he would. It may be several years down the road, but Peter says he will absolutely return to Doug to sell number 39. The Duncan Debrief free publication is available for aviation enthusiasts around the world through mail and online. To receive the magazine, subscribe here. Have an iPad? Access the magazine through the Duncan Debrief app. Search for Duncan Debrief in Apple’s App Store and download it. Once downloaded, you can receive push notifications each time a new Duncan Debrief magazine is published.